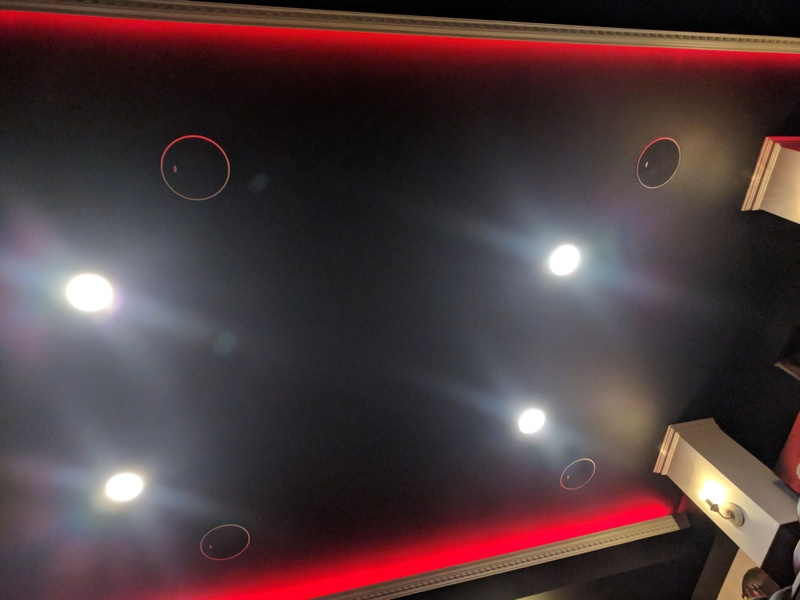 This is a completely built theater, which I know isn't in the spirit of these kind of posts but I thought their might be some useful after-the-fact information. Construction started in February 2018 and was completed in almost exactly a year. The Aurellian theater has been some where in my brain for the last 5 years - doing research piece meal as time allowed. 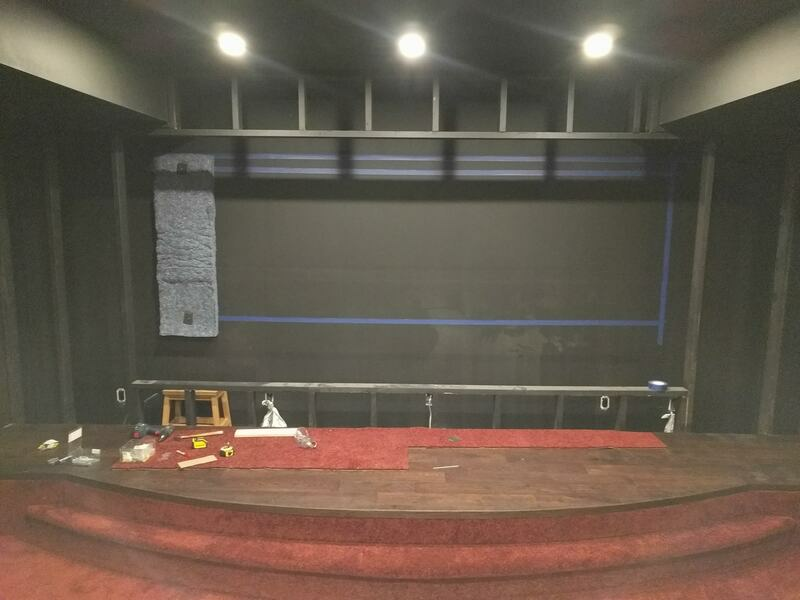 I was fortunate to know I wanted a theater when I built my house. 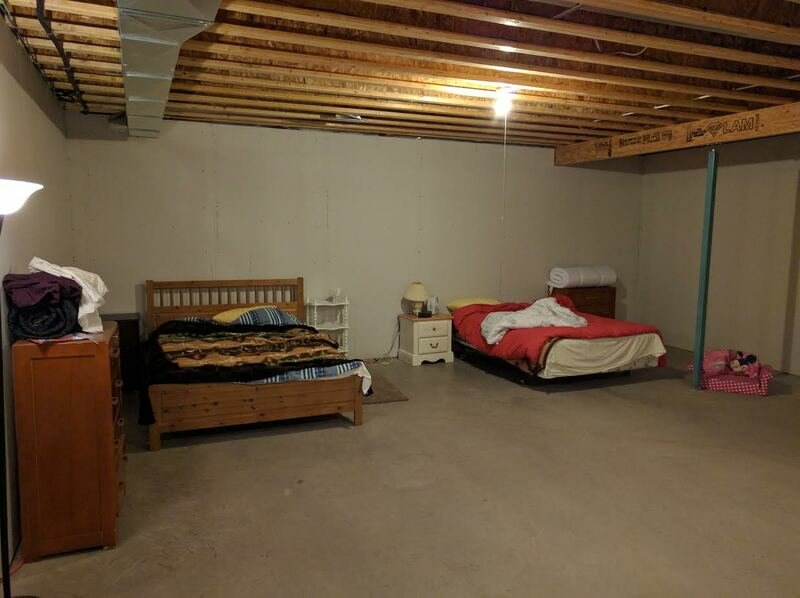 I left the basement undeveloped but included a a big room with tall ceilings and no windows. 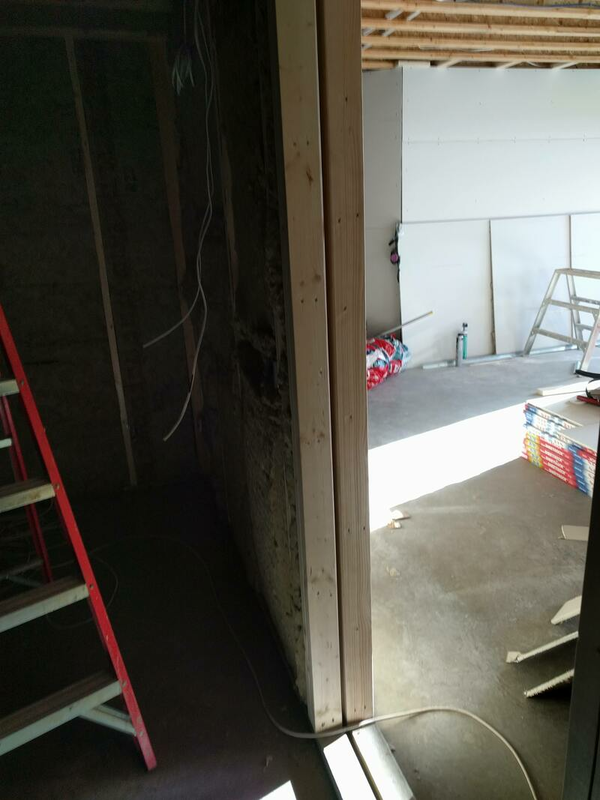 5 years after the house was built we finally started work on the basement. Starting the project I was a complete construction newbie. 'Studs', 'joists', 'conduit', 'clips', 'channels', 'soffit', not to mention the mysteries of HVAC, were completely foreign terms to me. The only tool I knew how to use was a screwdriver. Early on I went to a local AV store to ask how much design plans would cost. This was pretty much useless. No one was interested in detailed blue prints or schematics, they only wanted to sell me a laundry list of expensive hardware. The first place I went to quoted me $90K for speakers, a projector, screen, and seats. And we are still dealing with an unfinished room! Nothing about sound proofing or isolation. I was nervous about doing this alone but it seemed like I had no choice. Resources I used were the Home Theater Book and countless hours perusing posts on AVS forums. In the end however I did end up contracting a designer — Nyall from Acoustic Frontiers — as I had some decisions that were too big and too irreversible for me to decide alone (how many seats, sound isolation and treatments, others). Spending $3000 to avoid a $5000 mistake is an easy decision. Just having someone I can shoot questions to is invaluable piece of mind. I put a lot of money and effort into infrastructure. A speaker can be changed out, you can always upgrade a receiver, even a screen can be changed. 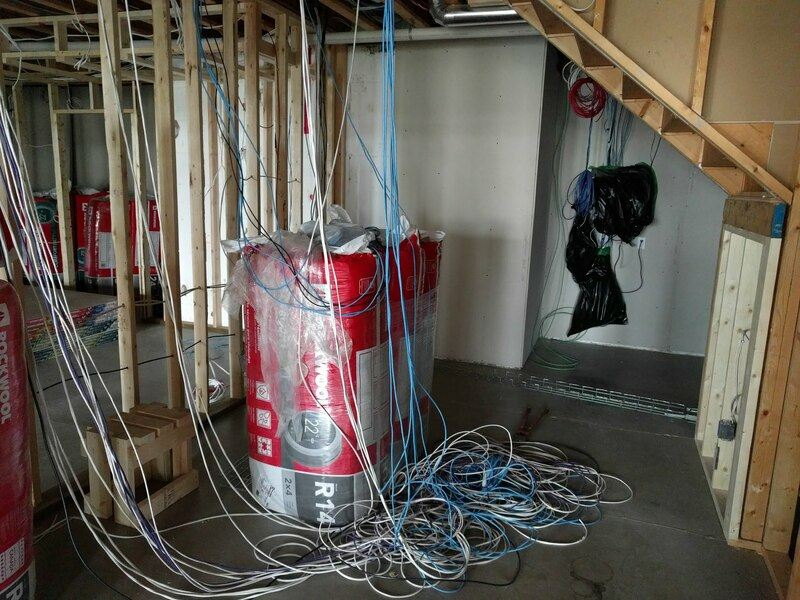 But if you didn't run that conduit, that wire, or that insulation, you're stuck. As such a large amount of my budget was on sound isolation & wiring. If you mess that up it's very costly to tear down and redo. I also spent a lot of time thinking about contingencies — what if I want to run wire in the future to here, there etc. This is cheap to do before the drywall (though I still spent $1500 on wires) it would be a costly mistake to forget. 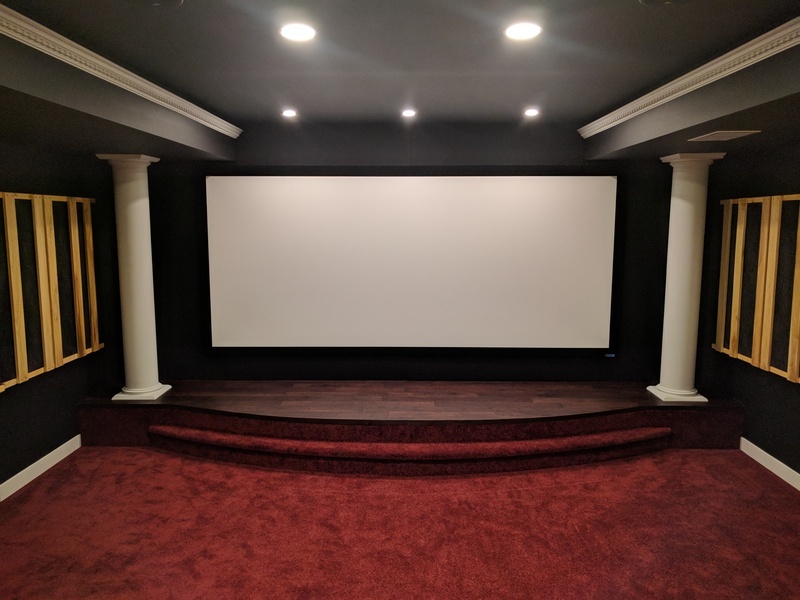 I did not spend a long time debating between different screens, picking out the perfect projector, or selecting specific speakers. I got all my speakers used in fire sales. I am a complete audio neophyte; I don't know what 'good' even sounds like. My plan was always to start with basic speakers and upgrade later. 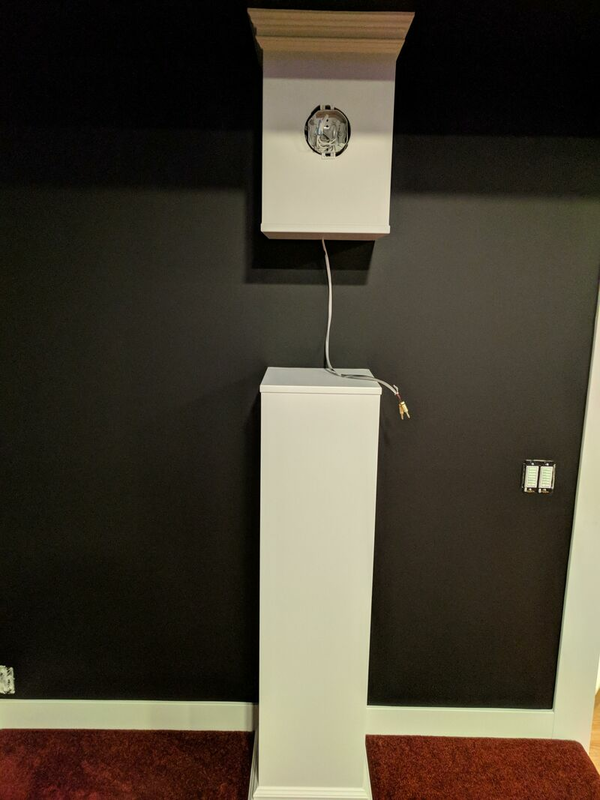 I spent $2000 for 15 speakers (4 subs, 11 bookshelf/ceilings), all of them used. 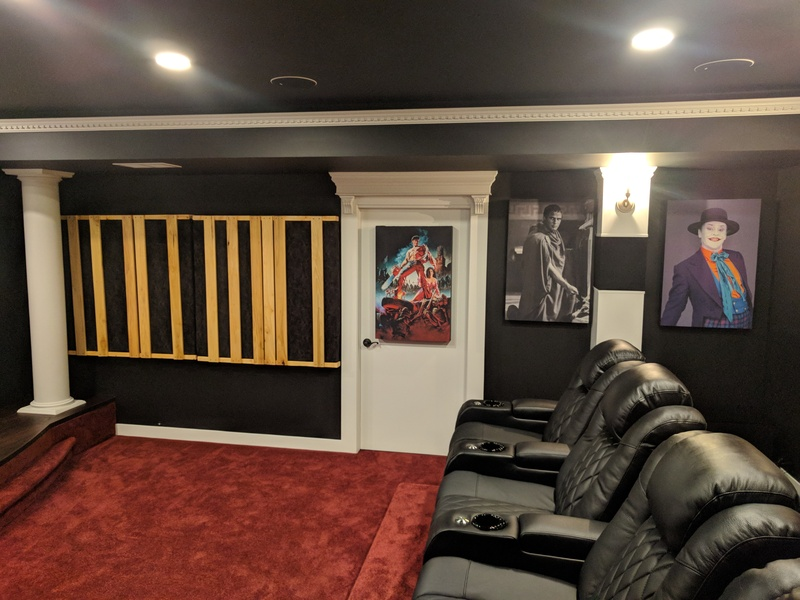 As the entire basement was done by a contractor it’s hard to narrow down how much of his labor costs were for the theater vs everything else. Regardless I was aiming for about $50,000 total for everything in the theater. 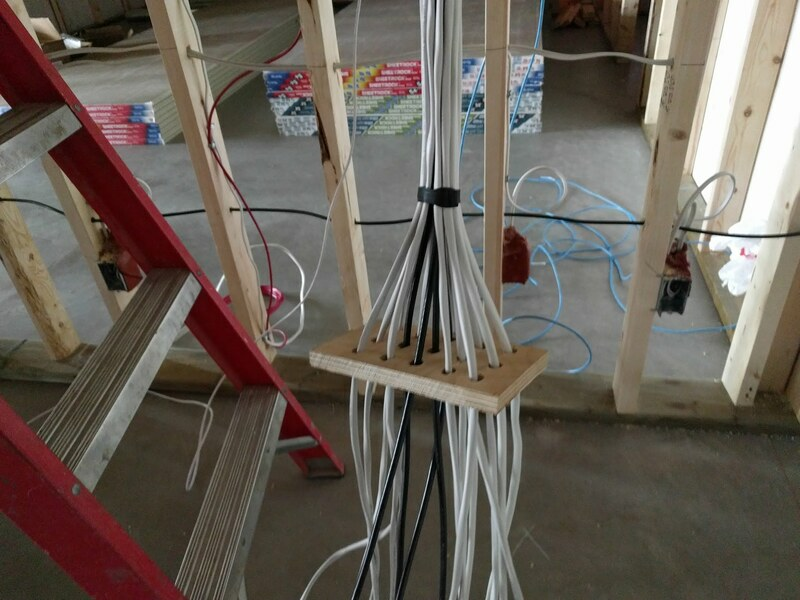 More than ⅔ of that was for the contractor & trades who handled the high voltage wiring, HVAC, and construction. 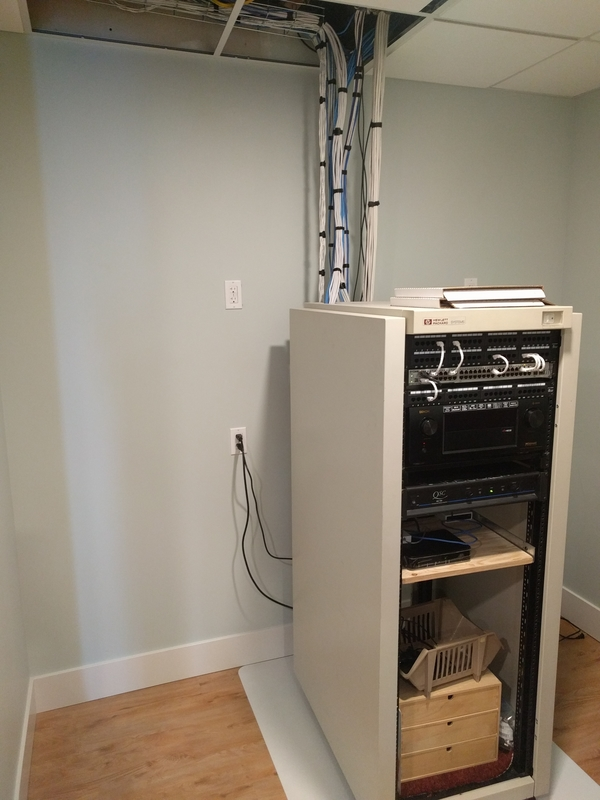 Most of my physical effort was in running and terminating low voltage wires and building acoustic treatments. 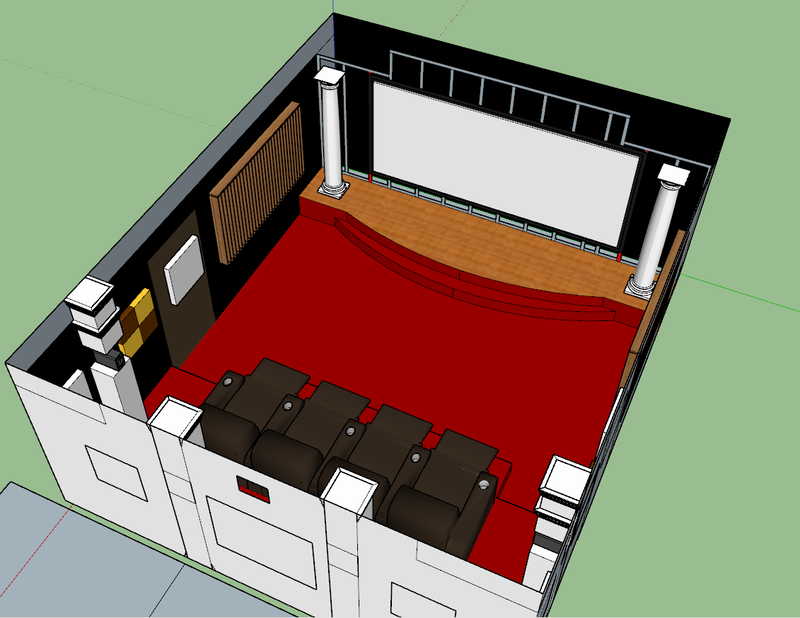 The theater was planned in 3 dimensions using SketchUp. I cannot emphasize how helpful SketchUp is. It allows you to visualize what you're doing in 3D. I used it in both planning my house and my theater. What looks like it fits on a 2D paper may be radically different when you add soffits and columns. "Jeese there's not much height above those columns", "That screen is really close to the ceiling." I figured out my preferred viewing angle and then decided on seats. You will have to decide are you building a theater for you, or for others. I decided to build it for my 4 family members. So the theater is optimized for 4 seats, with the option for some mother-in-law bean bag chairs in the front. The reality is 95% of the time it's going to be me in there, and nailing that perfect viewing angle was more important than putting in another row and having seats that are either too close or too far. Nyall provided me the blueprints which I then put into SketchUp to help with my planning. I came very close to the 3D model I had visioned. I opted for 7.4.4, which seems to be the gold standard currently. I added in extra wires for a 9.4.4 setup. The wiring closet (more like a wiring spare bedroom!) is right next to the theater, which eliminated any cooling or noise issues I may have. I also decided to project through a window rather than have the projector in the room itself. This took care of a lot of heat/noise issues. I knew I wanted an acoustically transparent screen and columns. I do not like seeing speakers scattered everything even if their wires are not visible, and columns worked well for the theming I had in mind. 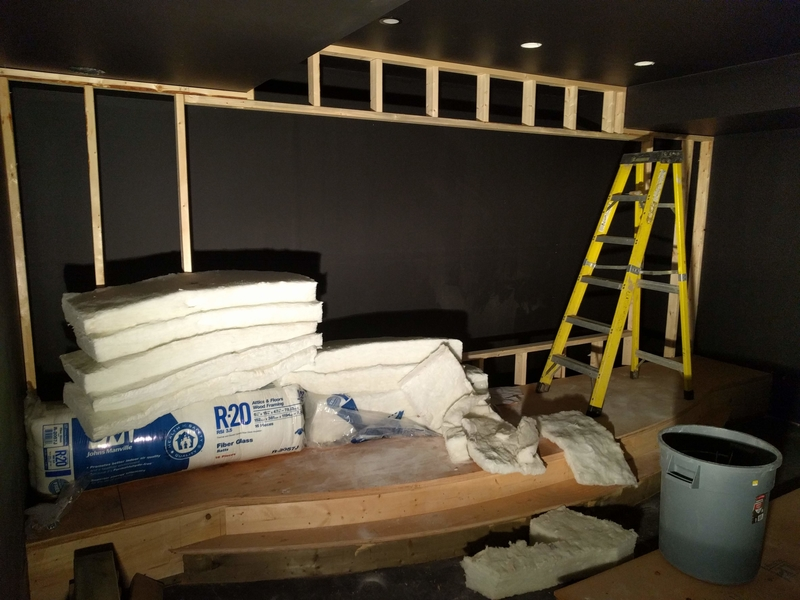 I also didn't want my theater to be a rectangular box, 4 chairs, and some rectangles on the wall functioning as acoustical treatments. Being in the room with nothing playing should be a relaxing experience. I wanted to give my room a uniqueness and went with a Roman theme. Nothing over the top. It should be obvious enough to be noticeable, but subtle enough that it's not tacky. 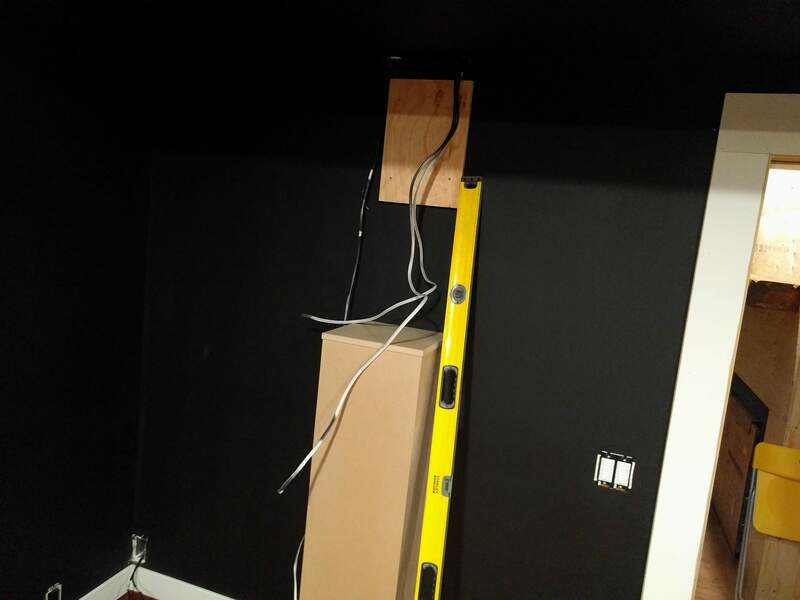 I built a staggered stud wall on the adjoining office and a double stud wall for the adjoining family room. The storage area was just a single stud. These walls all had double layers of dry wall with Green Glue and Rock Wool inside the cavity them. 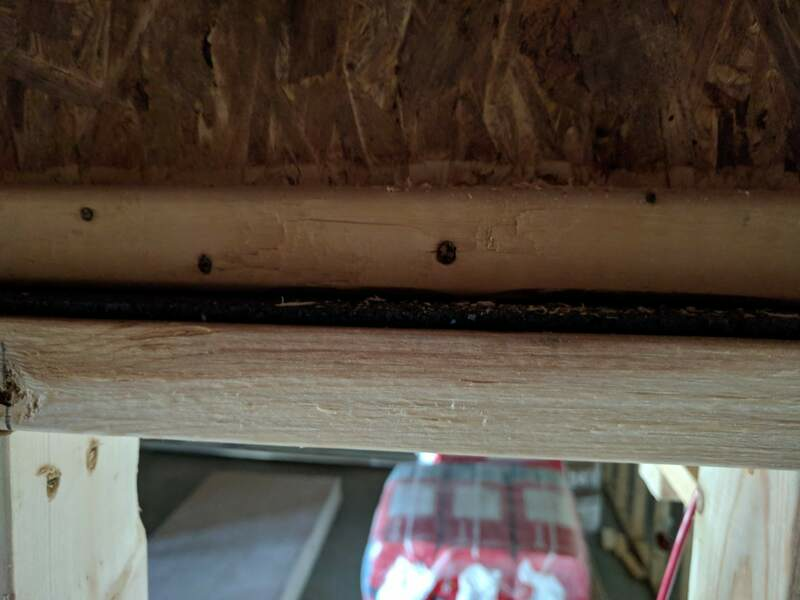 Rubber bushings were used to isolate the framing. The doors are solid core doors, however the double stud wall will accommodate a communicating door if I want even more sound isolation. At this time I'm undecided but currently don't think I'll need it. This is where I put most of my efforts. Living under hardwood is a sound nightmare. 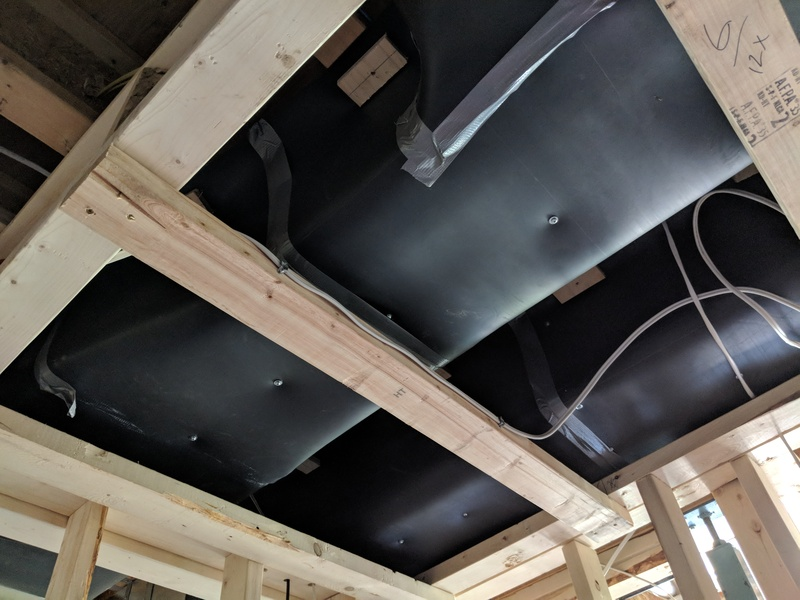 First, the stud walls were all isolated using rubber mats and isolation screws. The ceiling is a triple layer of 5/8" dry wall, Green Glue, with Rock Wood stuffed in between the joists. This is all suspended on furring channels set inside WaveHangers (similar to clips). 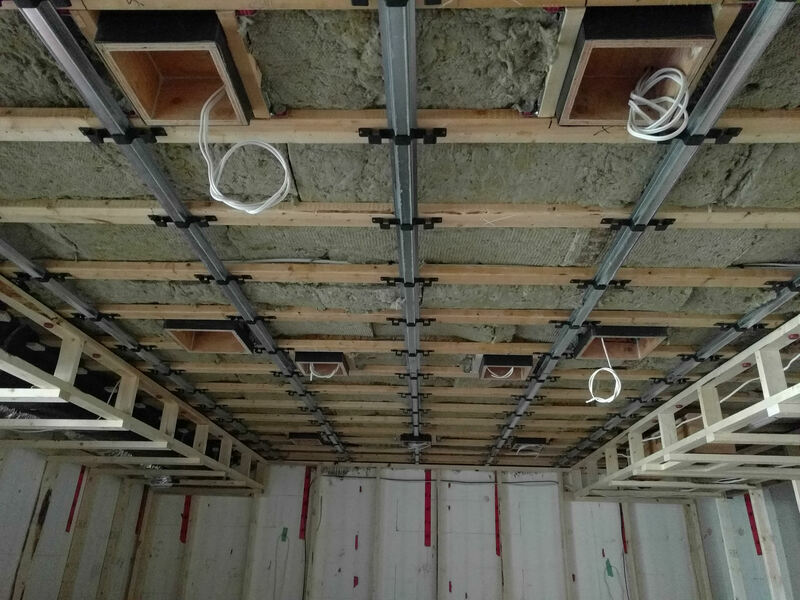 This was a unique challenge to find a drywall company comfortable with installing almost 5 times the weight of their standard drywall on to the ceiling! 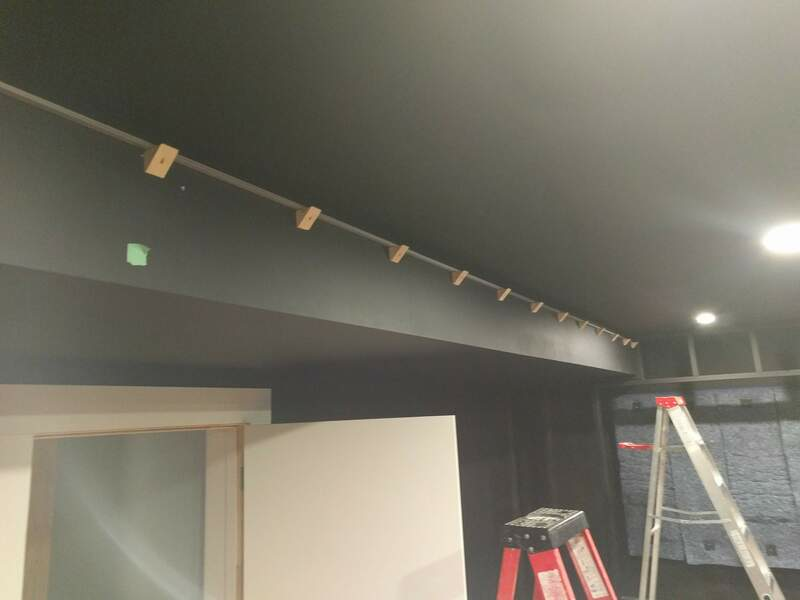 The border of the ceiling was taped with foam strips followed up with acoustically sealant. 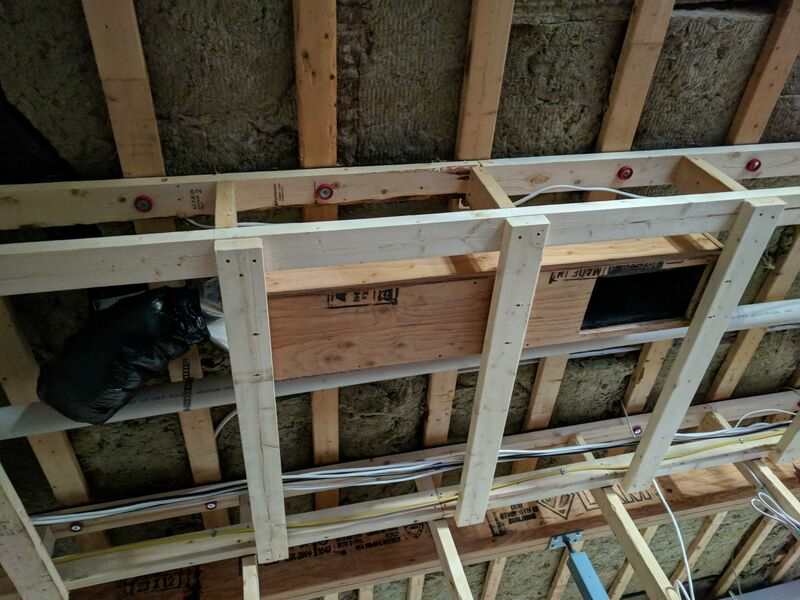 There are 7 lights and 4 ceiling speakers with backer boxes made of mass loaded vinyl around 3/4" plywood boxes and isolated from the joists with brackets. Panoramic fully taped and mudded room, an echoic nightmare! The room has a 6" Air supply into a 'dead vent' and 6" of return air through a straight curved ducts. Heated floors for winter are fabulous in the Great White North. There was a large duct running along the left side of the theater. This was covered with mass loaded vinyl. Unfortunately it was too close to the ceiling to wrap it completely on all 4 sides; the top was neglected. This soffit was then covered with insulation and 2 layers of 5/8" dry wall. 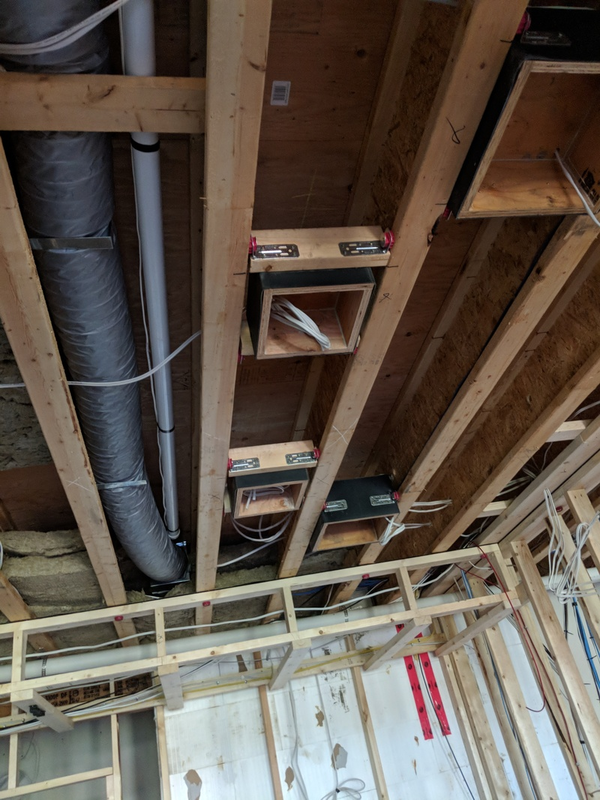 On the other side of the room was an empty soffit, purely built for symmetry, but it was very handy for running a huge 3" Conduit and many wires. 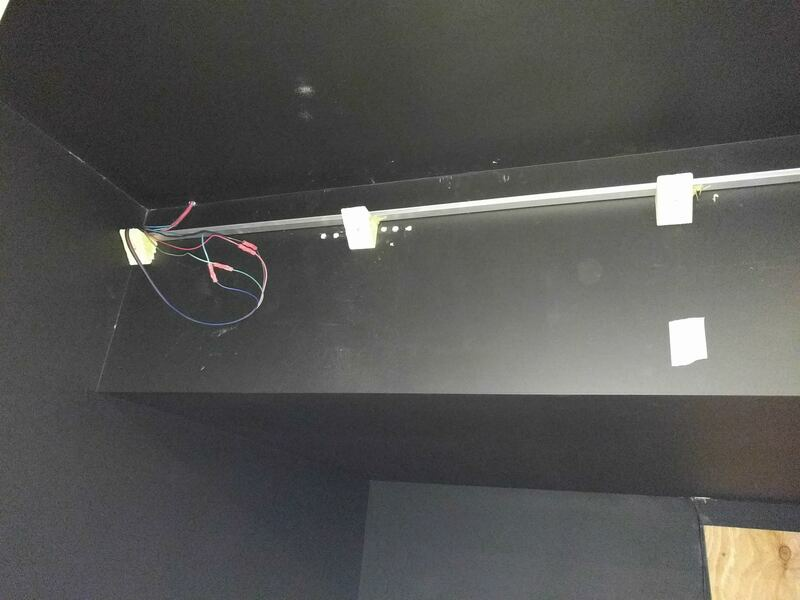 I also ran small conduit running to the main light switch when entering the room as well as under the riser. Three 14/4 cables were run to my main LCR speakers as they were about 50 foot from my Receiver. Everything else was 12G. I ran have 2 HDMI cables to the projector and one to my computer, they were ~ 15-20 ft but very expensive, they were on the pdf approved 4K list ($500 for 3 cables!!!!) I ran 4 14G wires to chairs for buttkickers and had power outlets in my riser and the 4 corners for subs. 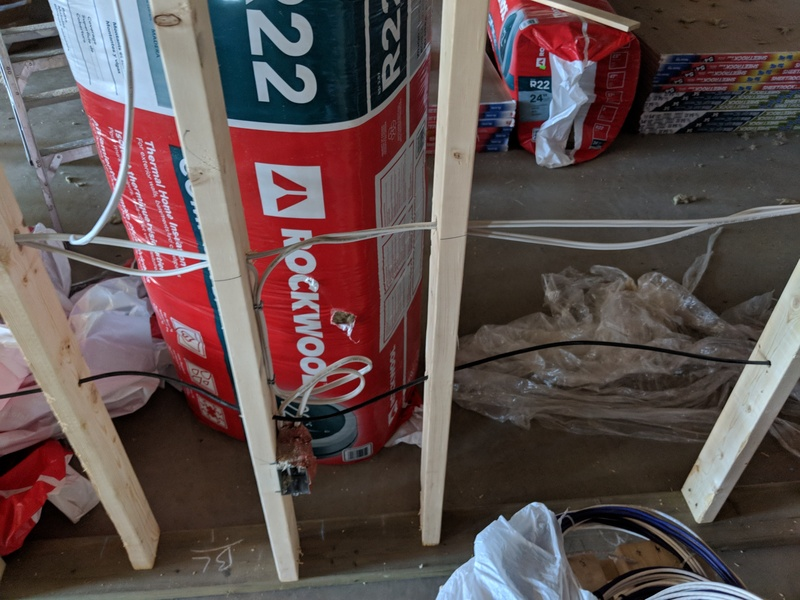 Coaxial cable was run to 4 corners of the room and I ran 1 coaxial cables between the front and rear pair of subs in case I wanted to daisy chain. Budget cable comb, great for presentation. Hours and hours later, much better! I initially planned on the riser only being in the back corner of the room as it is a little awkward to open and close the door. But with another door on the other end of the theater it didn’t work out so I have a symmetrical Riser. I did not use sand inside, just fibreglass. It has 2 Cat6 and 4 speaker wires and 2 power outlets. It’s 7” off the ground, not high enough for standard seating in the front row. Stage is set back 20” from the wall. This was tight particularly for corner subs. I heard some people suggest 3ft which to me seems crazy and a waste of space. You do need enough for your subwoofers, and here it was indeed tight but SVS makes some really good small subs if you need them. As far as pure vanity stuff goes, the stage has a curve which looks great but makes flooring choices trickier. It's stuffed with fibreglass. There is no wiring in the stage but there is a fat 3" conduit going behind the stage if needed. The Greek style columns are there for looks of course. I have 7 LED pot lights and they are plenty bright. I also went with sconces, cove lighting, and under-riser rope lights for cool factor. I debated on a star-ceiling but it’s a lot of effort and I already have cove lights. They are controlled with a Lutron system. I was looking at fancier patterned carpet but it was either just too ugly or didn’t fit the theme. In the end I went with a red color. 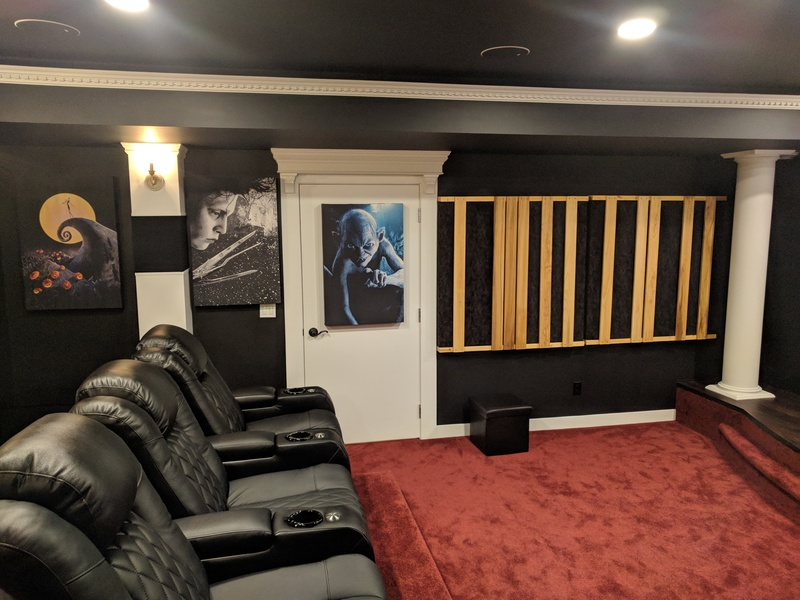 The 4 surround speakers are all in columns. They are 12”x12”x”15” tall which should accommodate any size bookshelf speaker if I decide to upgrade. The trim is of course in keeping with the Roman theme, as is the crown moulding on the cover. 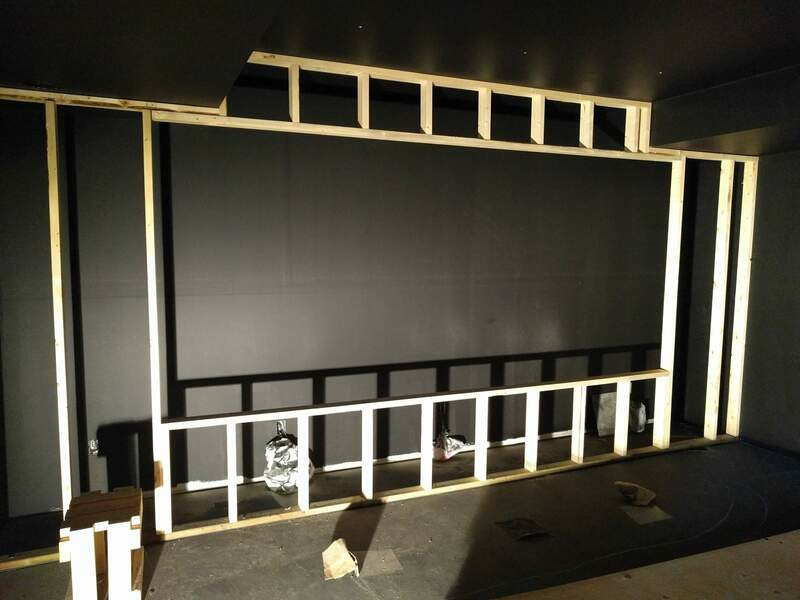 The black mesh boxes are just cube wood frames with GOF black fabric over top. They slide over top of the columns if I ever want to change the speakers out. I racked my brains about seating a lot. I really wanted 2 rows to be able to fit 7 people. The problem with 2 rows of seating is either one row is going to have a perfect viewing angle and another a terrible viewing angle, or 2 viewing angles that are at least mildly compromised. 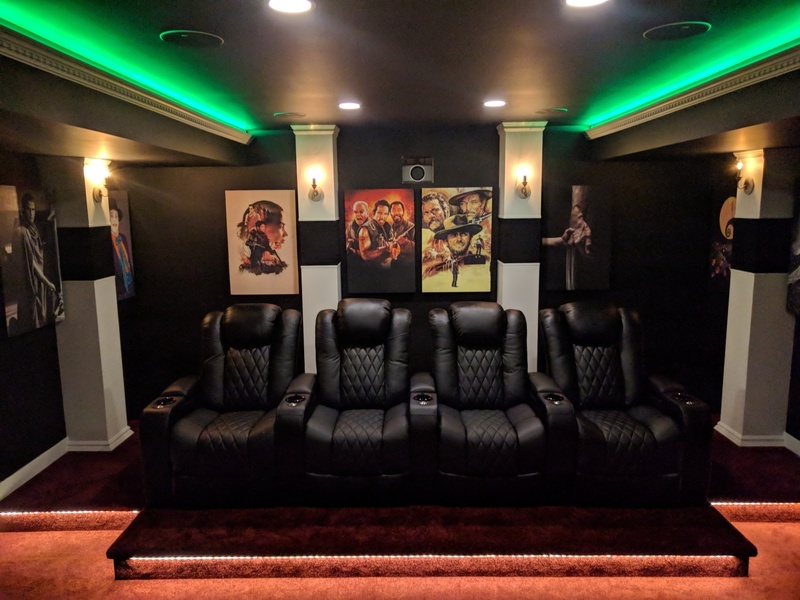 I built this theater for me so I went with one row of very comfortable recliners, and if needed I could throw some trash bean bags in front for guests and mothers-in-law. My seats are Valencia-Tuscany brand, mostly because they offer both lumbar and powered headrests. I was disappointed with them over all. They aren't as plush as I expected and the mechanism for the foot rests glitches frequently and I have to unplug the seats to reset it. The blue LED lights look neat but are a nuisance when watching movies, even if they can be turned off. The powered headrest should offer more support but it doesn't angle the way I expect them to. They do at least look nice. This is an acoustically transparent screen well within my budget at $2500. Very easy to put together, Seymour guys are excellent to talk to. The false wall is covered with friction fit panels made of GOM fabric and stapled. 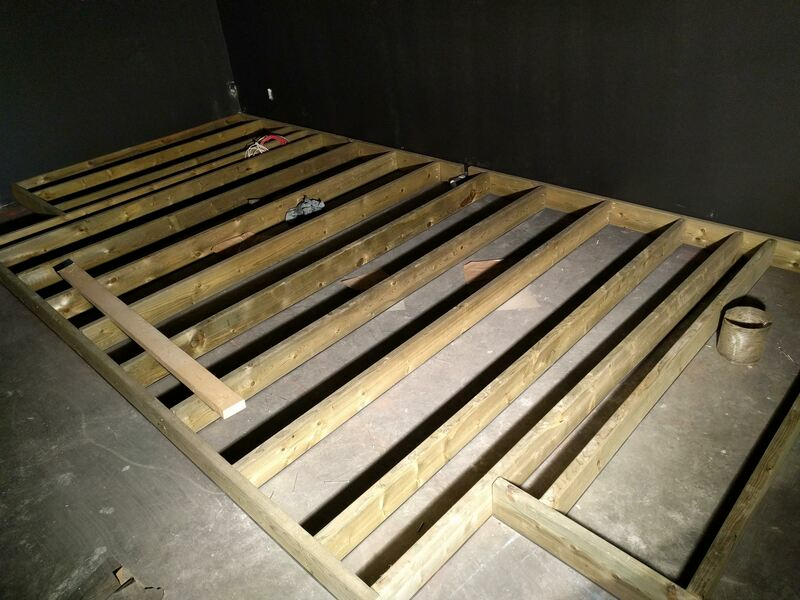 Nyall from Acoustic Frontiers helped with the overall treatment plan. I have 3” of denim/cotton bats on the front wall. I also custom made 10 36”x24” poster frames made up of a 24”x24” BAD panel I made using ⅛” hardboard. 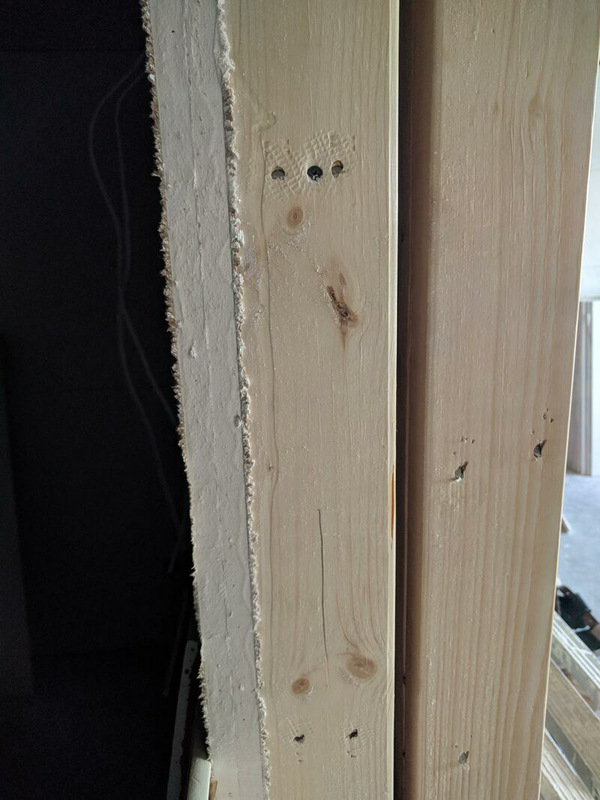 It’s by no means a perfect job - drilling these hold perfectly with a stack of 8 hardboards was tricky and some holes merged into other ones, but I think it’ll be good enough. 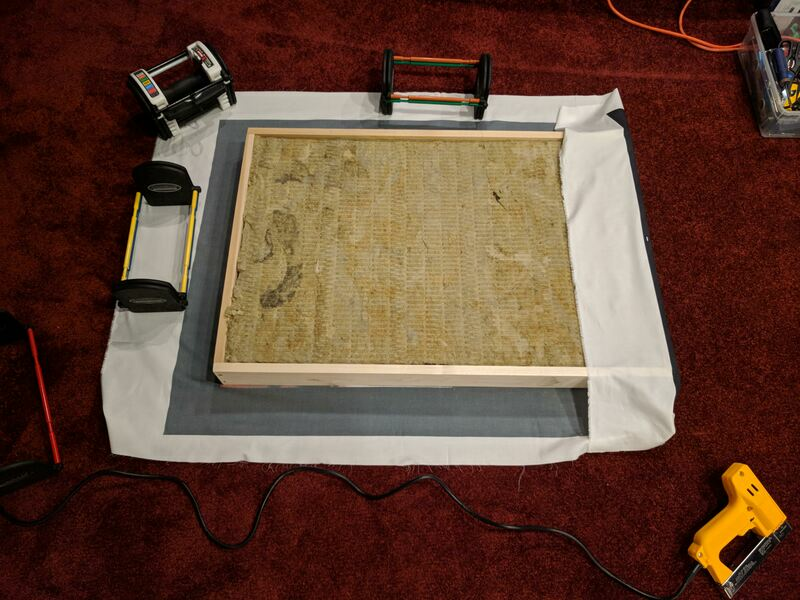 My plan called for 2D slat absorber/diffuser x 2 and this was the best solution I had as commercial products are expensive and hard to come by. I used 2 layers of 1.5” Rockboard to fill the rest of the cavity. I recommend the firm insulation boards over the bats as they stand up on their own and won’t slump. If you cut them snug enough they’ll sit in the frame without any glue or support - ‘friction fit’ if you will. I got poster fabric from MyFabricDesigns and they are amazing. Check out this thread for details: https://www.avsforum.com/forum/19-de...-cheap-38.html, I just love how these turned out and really adds to the atmosphere of the room. 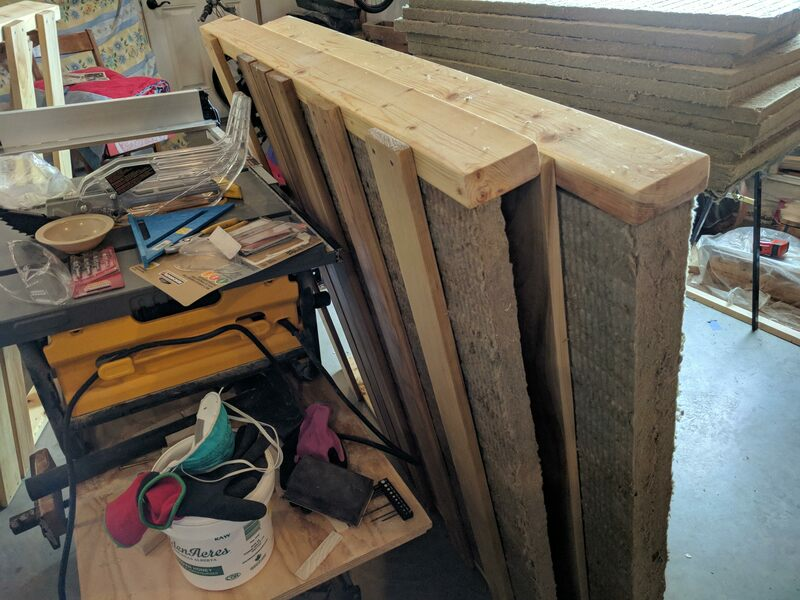 I also built a custom slat diffuser - this was just 4’ of 1”x4” poplar planks screwed onto 4’ of 2x4s. Behind them are 2 layers of 1.5” Rockboard stuffed into a pillow case. It’s not much to look at. I did do a linseed oil stain but in the end it still just looks like raw lumber. At some point I will work on the ceiling but that’ll be a later project. 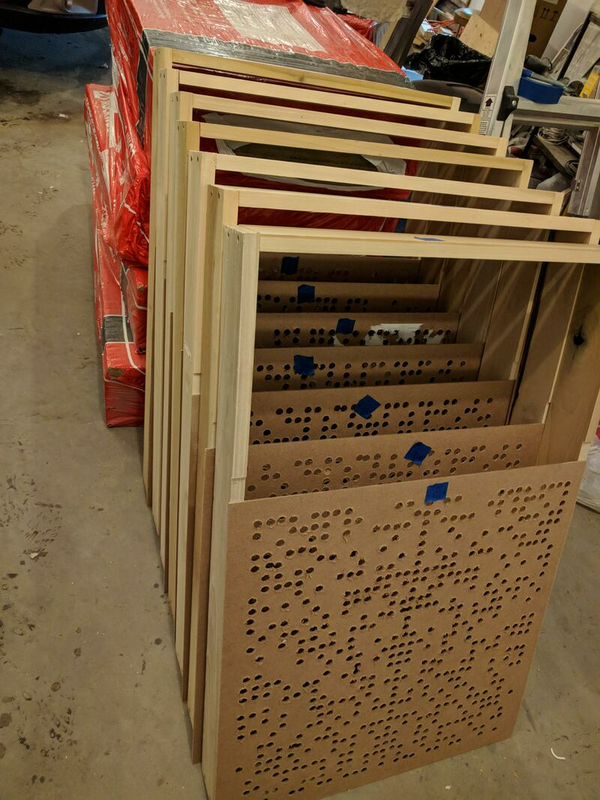 I highly recommend making your own acoustic panels, buying these online is ridiculous. The total cost of all my acoustic treatments was at most $1200 Canadian, which’ll get you 3-4 panels from most sites. 3" of denim bats to cover front wall. Receiver - Denon AVRX4400 Receiver. I got it because it was on sale and offered 11 channels of processing, but not amplifying! I didn’t read the fine print, so I have a separate amp driving 2 other speakers. Projector - Epson 4000 HC. I wanted some 4K capability and some motorized lens memory so I could swap between 16:9 and 2.35:1. As that was the bare minimum, an Epson 4000 on sale for CDN $1900 met these requirements. It projects through a window outside the room - I figured this would control noise and heat. It’s mounted on a cheap drop-ceiling Chinesium mount. I hate it, it’s flimsy, wobbly, and looks like the whole thing will come crashing down at some point. I will likely put in a dedicated shelf or get a better mount. I used Edmund Optics Antireflective glass x 2 for the projection window. Source - I use an Nvidia Shield with Plex. 4K movies are stored on my computer. Overall I am very happy with how things went and I stayed in budget. The best sounding movie I've noticed so far was Fury, the 4 subwoofers really get a work out and the Atmos overhead effects are amazing. I will likely upgrade speakers as time goes on but for now I'm very happy with the sound. At least I think I am, for all I know a more well trained ear will think it's terrible but I'm satisfied! Special thanks to Big, that guy's freelance advice is probably in the hundreds of thousands of dollars by now! I'll of course be subbed to this thread if anyone has questions. woodgieroo, bubbrik, NotShorty and 2 others like this. I was gonna say build pics or it didn't happen... Nice job!